Chicken Tonight will return to Australian TV screens this Sunday (1 June), with its first locally produced TVC in four years marking the launch of a new integrated campaign for the simmer sauce range. As readers will remember (how could we forget? 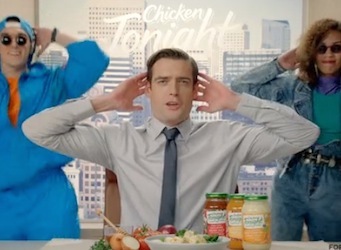 ), the ad comprises a throw back to the 90s when ‘I feel like Chicken Tonight’ became one of the most well-known jingles of Australian advertising. UK convenience food manufacturer Symington’s Ltd reached an agreement to license Unilever’s wet sauces portfolio in Australia and New Zealand last year. Symington’s took on three brands from Unilever: Chicken Tonight, Raguletto and Five Brothers. Under the terms of the deal, the three brands have continued to be produced at Unilever’s factory in Tatura, Victoria. “We have had considerable success ‘rebooting’ the iconic Chicken Tonight brand in the UK and achieved year-on-year double digit growth since relaunching the range in 2012, so we believe we have the right recipe for success in Australia,” says Symington’s Australia marketing manager Allen Hunt. “The challenge of the brief was to re-engage consumers who remember Chicken Tonight as a 90s family meal staple, while introducing Chicken Tonight to a younger generation for whom there is less nostalgia associated with the brand and the decade,” says Georgia Bruton, managing director of The Integer Group Australia, which created the campaign. The 15 and 30 second TVCs by The Integer Group Australia will run on Australian TV and digital channels for three months supported by PR, social media and in-store activations.